Imbolc marks the first of the fire festivals with candles being the central focus of sympathetic magic performed during this time. 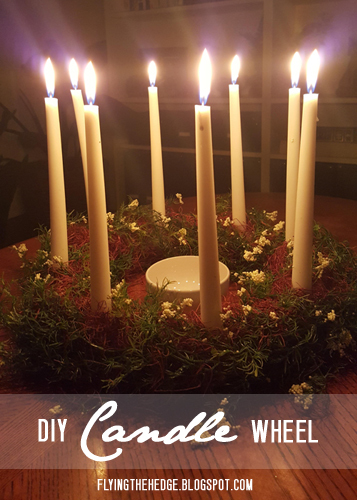 An old Imbolc tradition is the candle wheel, which can be either worn or used as a decorations on altars, tables, or windows. I created mine to be placed on the coffee table in our library/living room. First, line up your candles around your wreath. 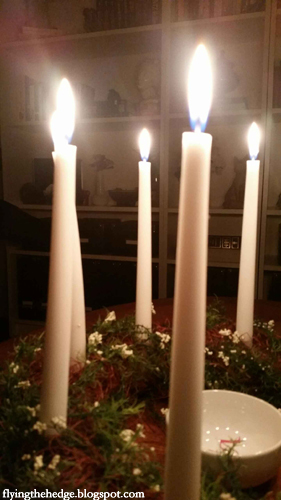 I placed one at the top, bottom, left, and right then added candles in between. After you have spaced them, push the candles into the foam to mark the ring you will cut out. Next, cut out the candle holes using your scissors or a knife. You will need them to be at least a half an inch deep. After you have a rough hole, push your candles into the holes and press hard, making sure not to wiggle the candle. This will create a snug, flat candle holder in the foam wreath. Remove the candles. After I cut my candle holder holes, I wrapped the wreath is the brown straw vase filler. You can find this in the wreath and moss section of Michael's. I did not glue mine down, but if you have spray glue, I highly recommend using it to ensure the straw does not fall off. If you are using the fairy lights, wrap them around your wreath next. However, the 32 inch long strand I bought was not big enough to wrap around the wreath, so I am going to return them. Next, wrap your greenery of choice around the wreath and place flowers throughout. You will see I didn't use my ferns or flowers. After adding the one greenery with white flowers, I felt my wreath was perfect. Make it your own. 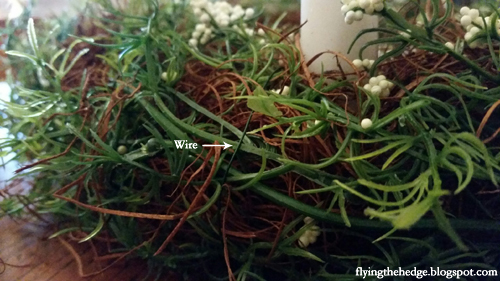 Next, you will want to wrap your wreath in floral wire. 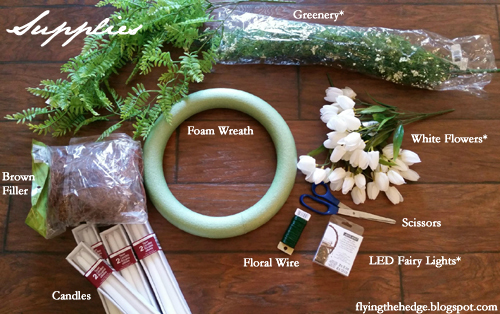 I stuck the first end into the foam wreath and tightly wrapped the floral wire around, making sure to secure the straw and greenery. I wrapped the lose end of wire around itself to secure it. 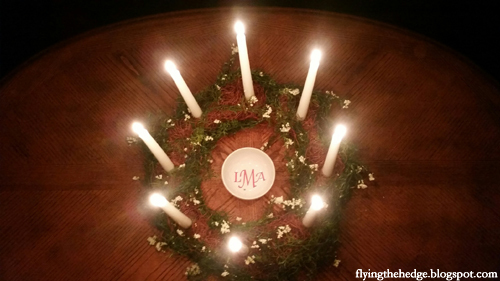 To finish your wreath, heat the bottom of each candle until it begins to drip. Quickly place the candles in their holders. Heating the bottom will cause the candles to stick to the wreath, ensuring they won't topple over or fall out while moving the wreath. However, it is not so secure that you can't easily remove them to replace candles or store the wreath. I placed a bowl in the center as an offering dish. As you can see it has my initials on the bottom. My boss gave the dish to me as a Yule gift, and I thought it would make a great offering bowl. And there you have it! 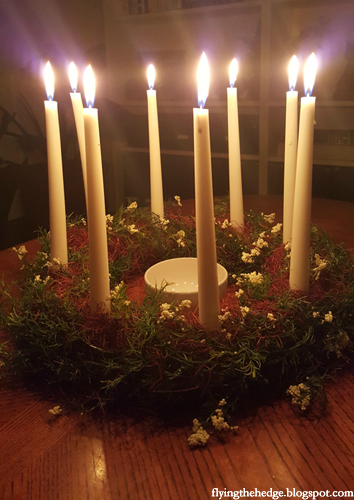 A gorgeous, one of a kind candle wreath for your Imbolc celebrations! Good luck creating your own. 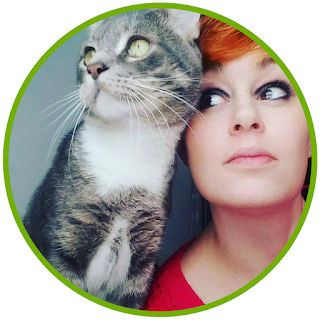 I would love to see your candle wreaths! CAUTION: This is highly flammable. Do NOT allow the candles to burn all the way down. Do NOT leave unattended. Magical Uses and History: Angelica, which derives its name from archangel, was once considered a cure-all by European healers. It was used to protect against or cure just about every ailment you can think of, especially the plague and poison. From the fifteenth century, there are records indicating that people wore or carried angelica to protect against the plague. According to one author, angelica blooms on May 8th which was traditionally celebrated as the Feast of the Apparition of St Michael. Due to its association with St Michael, people would weave necklaces for their children to ward off demons, witches, and enchanters. In Livonia and parts of East Prussia and Pomerania, peasants march into the town during early summer carrying angelica flowers chanting an incantation that has sense lost meaning. It is believed this is the remnants of a pagan festival celebrated during this time. Growing angelica around your home will protect you. You can also sprinkle it in the four corners of your home or around the perimeter to ward of evil and protect those within. Bathing in an infusion of angelica will remove not only curses, but unwanted spells as well. In some Native America tribes, angelica root was carried to increase luck, especially in gambling. The smoke is said to cause visions and aid in healing magic. Medicinal Uses: The roots and seeds of angelica are used to treat a variety of ailments, especially those regarding poor digestion, weak circulation, and respiratory problems. It also aids in recover from chronic illness. Despite its bitter taste, it stimulates stomach activity to increase appetite and digestion, soothe cramping, and elevate gas. It also eases respiratory conditions such as asthma, bronchitis, chest congestion, and cough. Due to its warming nature it is great for improving circulation and soothing fibromyalgia. The leaves can be used in a compress to soothe inflammation in the chest. It pairs well with chamomile. 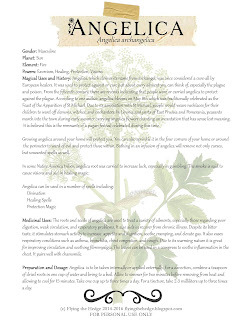 Preparation and Dosage: Angelica is to be taken internally or applied externally. For a decoction, combine a teaspoon of dried roots in one cup of water and bring to a boil. Allow to simmer for two minutes before removing from heat and allowing to cool for 15 minutes. Take one cup up to three times a day. For a tincture, take 2-5 milliliters up to three times a day. Look what came in the mail today! I am very excited to start reading this, although I probably won't be able to start it for another week. It's still pretty to look at though, don't you think? Have you gotten any new books lately, pagan or otherwise? Also, if you have any literary suggestions, please feel free to comment. I am ALWAYS looking for good books!